The goal of the Index is to make the principles and application of fair use more accessible and understandable to the public […]. The Fair Use Index tracks a variety of judicial decisions to help both lawyers and non-lawyers better understand the types of uses courts have previously determined to be fair—or not fair. This resource is pretty user-friendly. 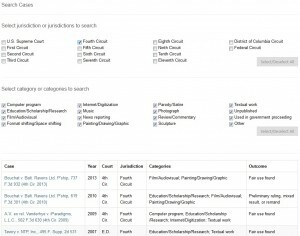 On the search page, simply select or deselect the federal circuits for the jurisdiction of interest to you, as well as the categories of fair use cases you’d like to see. The list of results is displayed right there on the same page, and automatically re-populates as you select and deselect options. For each case in the results list, the citation, year, court, jurisdiction, related categories, and even the outcome (e.g. “fair use found”, “fair use not found,” etc.) are all displayed right on this page, no additional clicks required. This allows you to quickly and easily scan your results, narrow or broaden your search, and choose the cases that you think will be the most relevant to your research question. Note that the Fair Use Index doesn’t include all fair use decisions, and it doesn’t provide the full text of the opinions themselves. As an index, it’s primarily a finding tool to help direct you to the cases that might be most relevant to your research. It does, however, provide a handy PDF summary of each case, which is broken down to include information such as Key Facts, Issue, Holding, and Outcome. If you need help using a case’s citation to find the full text of a case, check out our Case Law Research Guide. For more in-depth research guidance on this or another topic of copyright law, we also have a Copyright Law Research Guide. Finally, if you have questions along the way, don’t forget that you can always ask one of our reference librarians for help! This entry was posted in How-To, Intellectual Property, Research on May 8, 2015 by Anne Guha.